Lucy, Daniel, and I are in Champaign again visiting Phil and Jackie. We're having a great time. Daniel and I brought bicycles, so we've been riding a good bit. We rode to the garden, the library, and to the "Blues, Brews, and Barbeque". Today, Phil and I took a longer ride. We started out with a short ride with Daniel. I discovered that there is a new planned industrial park or something near the hotel, where they have built out the infrastructure which has a bunch of nice trails in it, but where no buildings have yet been built. It looks like it got built just before the crash and has been sitting empty since then. Wonderfully smooth paths around the detention ponds. 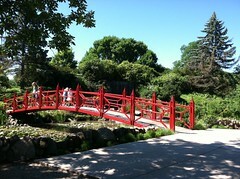 Afterwards, Phil and I rode to Mahomet and the Lake of the Woods preserve which has a lovely botanical garden. We rested in the garden and I wrote a haiku about the little girls on the bridge. After resting, we headed back. We had ridden into the wind, so the wind was mostly behind us on the way back. We had also ridden over the highest point in Champaign County, so we took a slightly different route back that avoided that particular point. This made it easier, but I was still pretty seriously bonked by the time we got back to the hotel. I put my bike in the room and, once we got to Phil's house, restored myself with a salad and lots of water. Last year, it was very hot and we spent a lot of time in the library writing. This year, we've been doing more stuff and have only come to the library to write a couple of times. But we're enjoying the wonderful weather and having a great time.